The law enforcement agencies of Bangladesh have shot dead more than 150 people in the name of anti-drug operation within several days across the country. Prime Minister Sheikh Hasina approved the anti-narcotics campaign in early May to tackle the spread of yaba and drugs. There is, and has always been, a massive support across the world for heavy-handed response to enforce the prohibition of drugs. But this crackdown against drug is using as a tool for killing the oppositions of the government. As the death toll soars there are growing allegations the campaign is a cover for a wave of extrajudicial killings and political intimidation ahead of a general election later this year. The massive scale of extra judicial killing is nothing but a project of governmental terrorism violating human rights and cleansing opposition. Since the operation was launched, more than 10 thousand people have been detained, while hundreds of drugs users have received fines, according to Bangladesh police and the Rapid Action Battalion (RAB) forces. In the latest incidents, a number of suspected drugs traffickers were killed in exchanges of fire when they were either approached by RAB forces or during raids in a number of districts, officials said. Referring to the law enforcers’ claim that the ‘gunfights’ ensue as they retaliate upon being attacked by the criminals, but no legal procedure is known to determine the authenticity of such claim. Leading human rights groups have denounced the move as “illegal”. Activists say, these are nothing but extrajudicial killings amounting to a serious level of human rights violation. The forces have a free hand and are acting as judge, jury and executioner. Questions are being raised about some of those killed in the campaign against the “drug menace”, with one family telling the Guardian their relative was an opposition political activist who never touched drugs. They and another family say their relatives were last seen being taken into police custody hours before being found dead in what authorities are characterizing as nighttime shootouts with criminal gangs. Ekramul Haque, Teknaf Municipality councilor, was killed in a so-called gunfight with Rapid Action Battalion (RAB) in Cox’s Bazar on May 26. Five days later, his family distributed four audio clips that recorded terrifying conversations between Ekram and his daughter and wife before he died in a hail of bullets. The audio recorded on a mobile phone also captured sounds of gunfire and groans of the dying man. The death of Ekram illustrates how suspects are killed in overnight raids which security forces later routinely portray as gun battles. Ayesha Begum, the wife of Ekram, held a press conference in Cox’s Bazar, where she claimed that her husband was killed in cold blood, not in a gunfight as the security forces claimed. “On the night of May 26, an official of a security force took him by force from our home. My daughter and I talked to him over phone after he left us. When we talked to him last, he was panicking. The phone call continued and gunshots and shouts were heard. It was then I realized that my husband was killed in cold blood,” she said. It is said that Ekram, also an upazila-level leader of the ruling Awami League, was a victim of internal party politics. The Lawmaker Abdur Rahman Bodi, whose name appeared in intelligence reports of five agencies that also listed several of his relatives and associates, is the godfather. The report reads that Bodi controls yaba trade from behind the scene. Being a lawmaker of the ruling party, he does the business freely along with a significant number of followers. But Bodi is out of touch and he has left the country safely. Another of those killed was Amzad Hossain, who police say was gunned down after leading police to a drug hideout in Netrokona town. The gang fired on officers and Hossain was killed in the exchange of fire, police said. “There are 14 murder, violence and drugs-related cases pending against him,” said Ashraful Alam, additional superintendent of Netrokona district. “Following a tip-off we raided his house and recovered a good amount of yaba pills from the spot. Later, he got killed in crossfire when, after being challenged, some other members of his gang fired upon us,” he said. But his brother, Mahid Ahamed Ansari, said, Hossain had no connection to the narcotics trade, claiming police had violently raided their home hours before the alleged shootout. “During the surprise raid police beat up my brother badly,” he said. “The charge that he sold drugs is completely baseless. They killed him just because he was a popular activist of the student wing of the BNP.” He said the cases against his brother were part of a campaign of harassment against opposition political activists in the lead up to national elections later this year. in Feni and Gazipur, families of men killed in police shootouts have alleged that their killings had something to do with bribes. 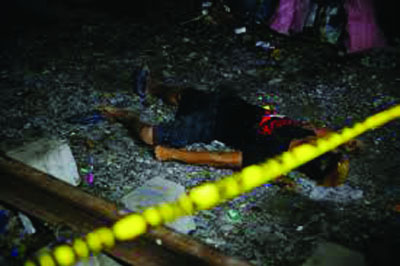 In Chittagong, security forces allegedly killed an innocent man based on inaccurate information provided by a source. The original man was later found and killed, so was the source. These dangerous developments indicate what lies ahead with the security forces given a carte blanche. In international media, this anti-narcotics raids have already drawn comparisons to a Philippines-style, where its President Rodrigo Duterte declared a war on drugs, with his security forces killing over 12000 people. The scale of the bloodshed and reports of summary executions of Bangladesh have led the American embassy to voice worries over the killing. “Of course I express concern about the number of people dying,” Marcia Bernicat, the US ambassador, said. “Everyone in a democracy has a right to due process. If there is a violent confrontation people may not survive that, but the goal should be zero tolerance, the goal should be to try and bring everyone to justice,” she said. It is true that the drug addiction remains a serious problem in Bangladesh. Severe drug addiction has affected the productivity of a major portion of its human resources, especially the youth. The Department of Narcotics Control (DNC) in its Annual Drug Report of Bangladesh 2013 revealed that the country had about five million addicts, 50 percent of them located in Dhaka city alone. Two years later, a report in The Daily Star suggested that the figure has reached seven million. Bangladesh stands eighth among the world’s top 10 drug abusing countries. It is a tragedy that due to the greed and profit mongering of traffickers, millions of youth fall victim to the habit of taking drugs. These addicted people are on a steady path towards untimely destruction and death. It is a socio-economic and cultural evil that affects the victims, as well as the nation and society. The smuggling of yaba tablets from Myanmar in recent years has become another serious threat to the younger generation of Bangladesh. It is a highly addictive mixture of methamphetamine and caffeine known as ‘Nazi speed’ in the West. It was first developed by Hitler’s scientists to keep soldiers capable of fighting for days at a stretch. It entered the Bangladeshi market in 2006 as a ‘fashionable drug’ for the well-to-do people. Because of its covert symptoms, this ‘madness drug’ is now the number one choice of the addicted population in Bangladesh. It can be swallowed, injected or sniffed, depending on the desired lasting effect of the drug. The middleman of the yaba trade gave a description of how the entire chain of the yaba trade works, the Dhaka Tribune reports. A strong syndicate controls the entire yaba trade in the capital city. Some sources said it is a 33-member syndicate while other sources put the number at 50. The middlemen report to these “yaba lords.” Members include people from virtually all professions – policemen, lawyers, government employees, and so on. One of them was a police sub-inspector named Mahfuzur Rahman from the force’s Special Branch (SB). He was arrested in June last year along with 680,000 yaba pills in Feni district. It was said at that time that he was on his way back from Teknaf of Cox’s Bazar – the hotbed of yaba trade in the country. According to a report of Prothom Alo, Awami League parliament member Abdur Rahman Bodi is the chief patron of the crimes. When the crackdown victims are mostly general innocent people and from oppositions of government, it seems that the campaign had little to do with stopping drugs. Instead it was likely to be intimidation ahead of a general election pencilled in for the end of the year.